We are impressed to already have more than 800 registered participants, including government delegations from over 50 countries. Please find the full list of participants here. We feel especially honoured to welcome the Deputy Secretary-General Amina J. Mohammed for a Special Address during the opening of the Regional Forum. One and a half days filled with a diverse programme await you in Geneva. Have a look at the preliminary programme in English, Russian or French. Please also find the provisional agenda here in English, Russian and French. What will be discussed at focus events? Technology, Digitalization, Artificial Intelligence – Curse or Blessing for Sustainable Development? Panellists will provide introductory inputs followed by an interactive discussion with the floor. What are the topics of the round tables? At round tables, country representatives and other stakeholders will share concrete case studies from their national experience and discuss how these best practices can be adopted by peers. Have a look at the compilation of case studies in preparation for the round table discussions. upon invitation or nomination. Civil society participation is coordinated through the Regional Civil Society Engagement Mechanism (info@unece-rcem.eu). What can I do during breaks? Which pre-meetings can I attend? The Regional Forum will be preceded by a civil society pre-meeting; please find further information in the preliminary agenda. For the first time, a pre-meeting for and by young people will be held to channel the input from young people to the Regional Forum. Please find further information in the agenda. 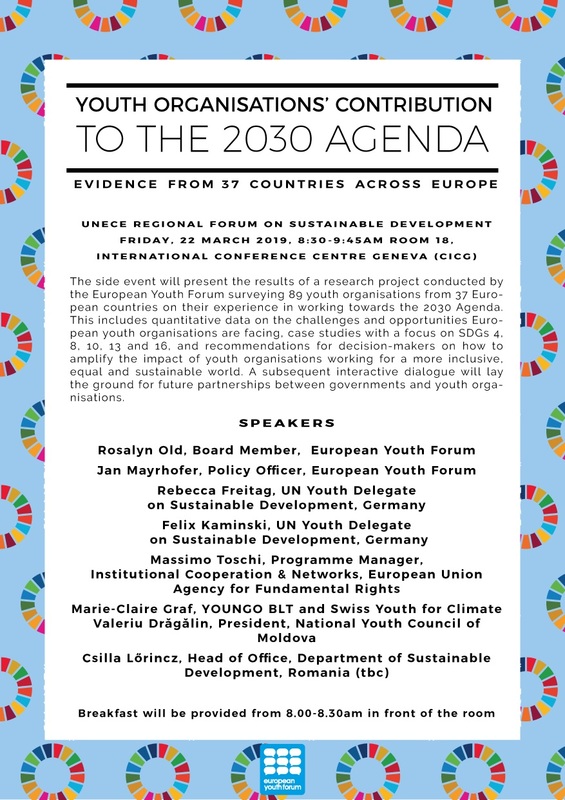 All stakeholders from governments and civil society are welcome to join the open session (21 March, 13:00-14:45) and engage in an interactive dialogue with the youth participants. Led by UN Volunteers (UNV), this consultation will engage member states, UN bodies and other stakeholders in highlighting regional perspectives on volunteerism in the region. Key findings from the Regional Synthesis Report on Volunteerism will be presented and discussed with participants during the event. Please register through the registration link. All the essentials on logistics are summed up in our guide for participants. Have a look and find everything at one glance. Simultaneous text versions of speeches and statements (captioning) will be provided for all sessions in the plenary room of the Regional Forum. At the plenary sessions, a web link will be provided to participants to display spoken statements as text on your mobile device. Please also note that the conference venue is accessible for wheelchairs. How are we progressing on the SDGs? Have a look at our brief snapshot report on some aspects of SDG performance in the UNECE region. The report covers the SDGs that will be discussed at the 2019 Regional Forum but does not attempt to provide an exhaustive assessment. It mainly uses the available information in the UN SDG Global Database and the sources referenced there to illustrate a selected number of SDG issues. Follow the latest updates on social media via #RFSD2019.